Jerusalem on the Madaba Map 6th century A.D.
Providing Affordable and Quality Antiquities and Ancient Coins from the Holy Land and Beyond. Previously an Associate of the Former Sotheby’s.com. 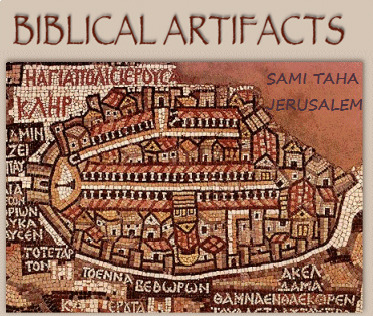 “Biblical Artifacts" is brought to you by Sami Taha - Serving Jerusalem and the world's market for antiquities from the Holy Land by authority of the Israel Antiquities Authority. In addition to the sale of antiquities and numismatics we also provide appraisal services and accept items for consignment. Antiquities Dealer License No. 144-Since 1988.